Customers in India grabbed Redmi Note 7 and Redmi Note 7 Pro smartphones like hotcakes in spite of the infamous flash sales and yet many consumers were unable to grab them during Flash sales. Out of these two smartphones, Xiaomi is making the standard variant of Note 7 available without any flash sales and you can grab it any time you want. The company promises that they have enough stocks available to fulfil the demand. The announcement comes from Manu Kumar Jain through his official Twitter handle. 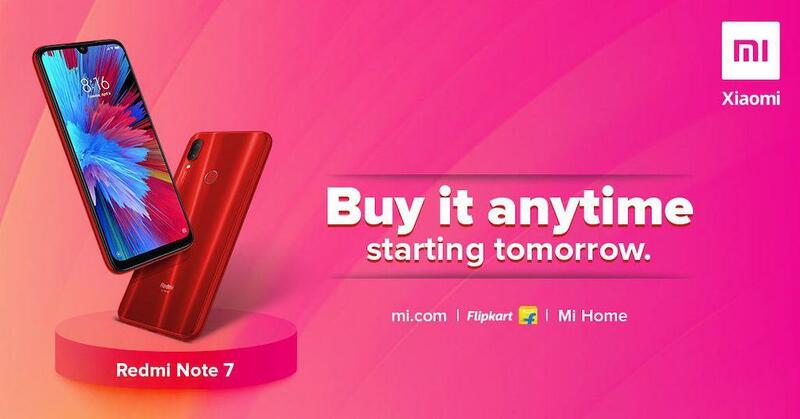 Unfortunately, if you want to buy the Redmi Note 7 Pro, you still need to grab it through infamous flash sales. Redmi Note 7 features a 6.3-inch Full HD+ display with a waterdrop notch powered by 2.2 GHz Qualcomm Snapdragon 660 processor. The phone is available in 2 variants in India: 3GB of RAM + 64GB storage and 4GB of RAM + 64GB storage. The device is backed by a 4,000 mAh battery which supports Quick Charge 4 over USB Type- C. The Redmi Note 7 has a 3.5mm headphone jack, supports face unlock via the selfie camera, and has a rear-placed fingerprint scanner.